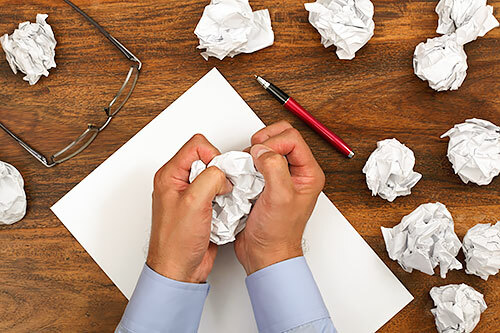 Do you get frustrated when you have to write in English? People often say that writing in English is very difficult. Why? Because you need to know a lot of vocabulary words and how to construct sentences in English to express your ideas. Then, everyone can easily see your spelling and grammar mistakes. Ugh! USA Learns has lots of different writing activities to help you feel more confident and comfortable when you write in English. In spelling and dictation activities, the program carefully guides you to write in English with more accuracy and confidence. Lines on the screen indicate how many letters are in the words. In most activities you can listen to what you need to write. These activities will also show you where your errors are in spelling. The activities guide you to successful writing in English! 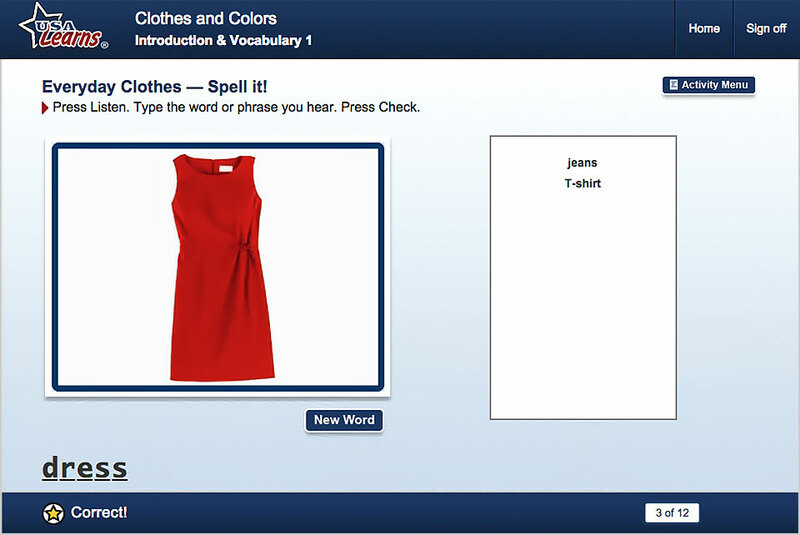 In all three USA Learns Courses students begin writing single words in the activity, Spell It! Listen to the word. This will help you connect the letters and how they sound in English. Good for reading, pronunciation, and writing! Listen and use the words to write a sentence. In the next stages of writing activities, you listen to a sentence. The words on the screen will help you type the correct sentence. This step helps you construct correct sentences in English with more confidence. Write a one-sentence answer to the question. 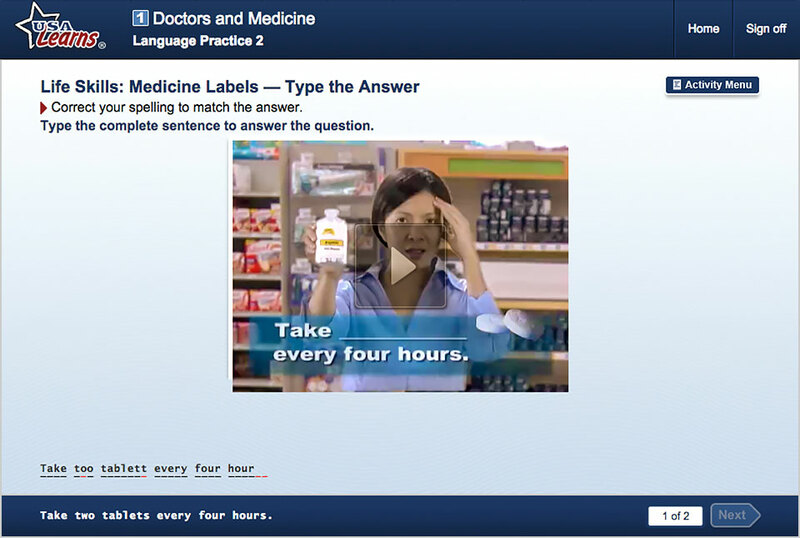 The writing activities become more challenging when you write a one-sentence answer to the question with no help from words on the screen. 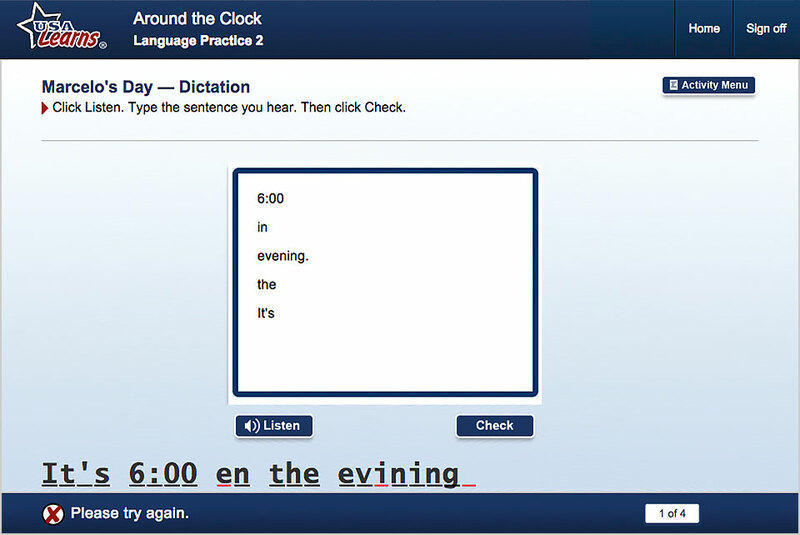 In Spelling and Dictation activities, the program shows you your errors and also how to write the answer correctly. You should always correct your writing to help remember the right way to do it in English. You write down things you need to remember, right? So always write the correction so you will remember it! There are also many opportunities on USA Learns to use the new English words and grammar you have learned to express your own ideas in English. 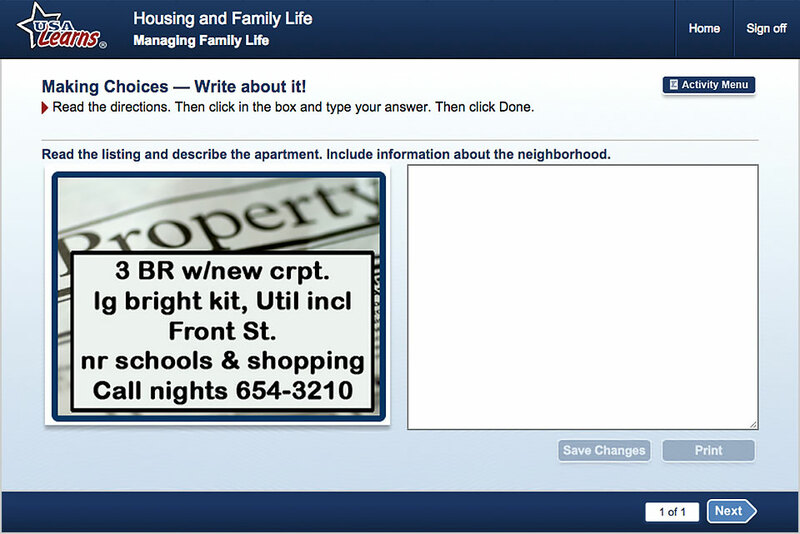 In the free writing activities, you see a writing prompt, video clip, photo, or audio segment. 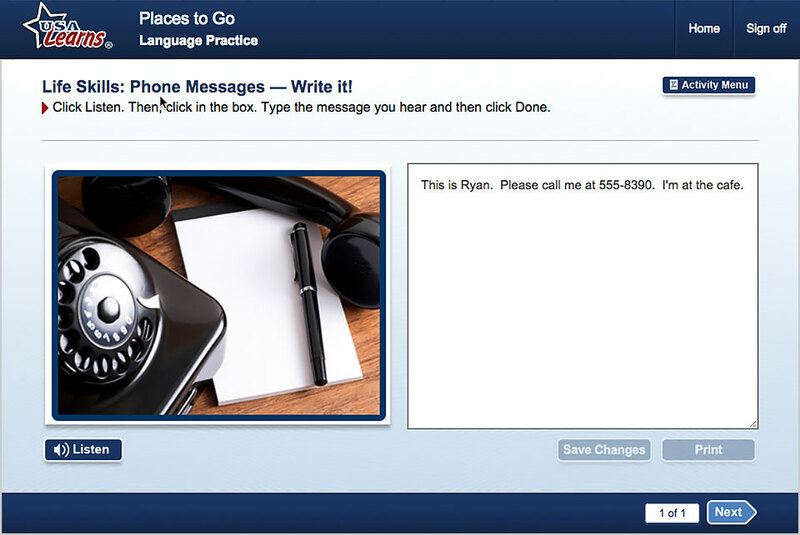 In the writing box on the right side of the screen, your text can be changed or moved. If you are in a teacher-created class, teachers can see, comment on, and grade your writing from the teacher’s site. This beginning level writing activity gives you some questions and sample sentences to give you some ideas for your own writing. 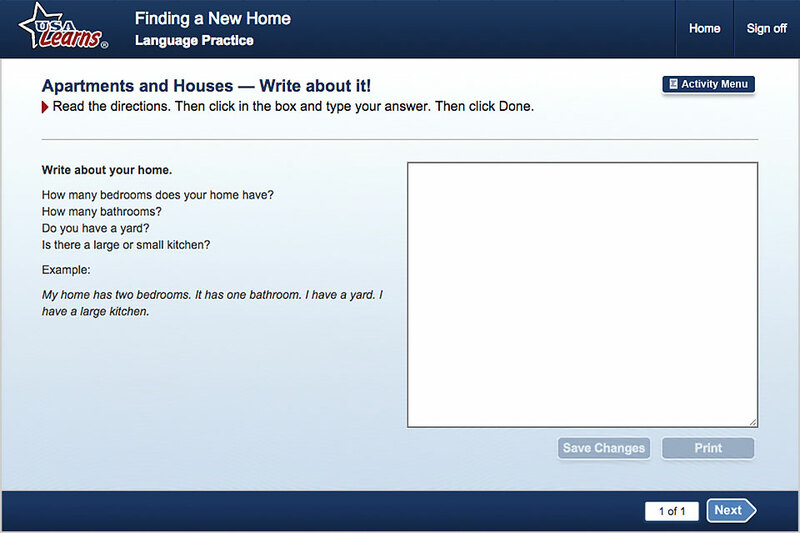 In this intermediate writing level sample, you need to write a description of this home based on an advertisement that uses abbreviations. Every day we need to write for many different reasons. We may write down a phone number and a message, or fill out a form in English, or write a note to a teacher. Sometimes we have to write something that another person tells us in English. USA Learns’ life skills writing activities prepare you for these kinds of real-world writing tasks. Write a to-do list of the jobs you want someone to do in your home this weekend. You can learn about more types of Life Skills activities in USA Learns here. Writing is an important tool to help you learn and remember English. Think about it. We write things down so we don’t forget them. So, the more you write in English, the more you will remember vocabulary and sentence structure. Don’t be afraid of writing. Use it to help you learn and remember! 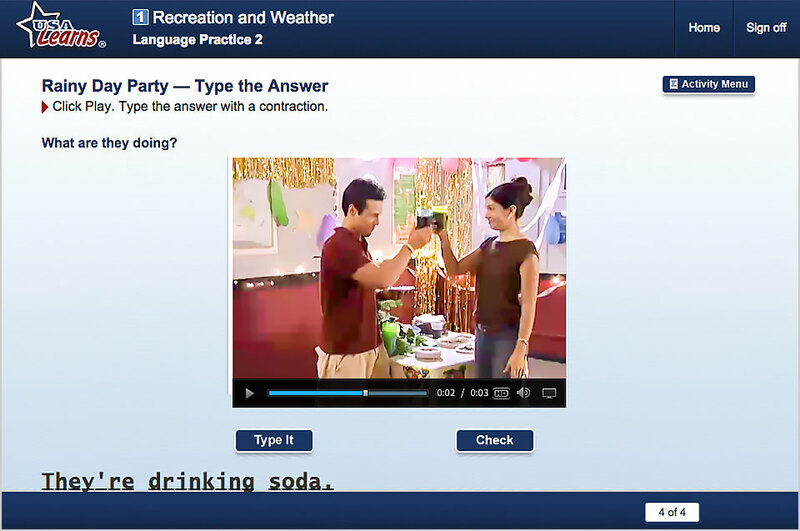 USA Learns activities will help you feel more confident when you write in English. ePortfolios: What Are They and Why Should You Have One? You are going for a job interview, and your boss says, let’s see how you write. You smile, show him your phone and proceed to present your writing to him. The link to all your work is also attached to your resume and you explain that writing is something you have been perfecting for a long time. It impresses the boss and you have a new job. This is what you can do with an ePortfolio. The “e” stands for electronic and the portfolio is a history of your writing. Artists have used portfolios for a long time to highlight their artwork. Bankers create investment portfolios for their clients. In the future, writing portfolios will be linked to individual profiles for employers to assess potential employees. How can you make an ePortfolio? The easiest place to begin is to get a Google Account. Google has many free tools that you can use to make an ePortfolio. You can start the portfolio on a computer, but with free Google apps (application), it is easy to have your portfolio accessible by phone. 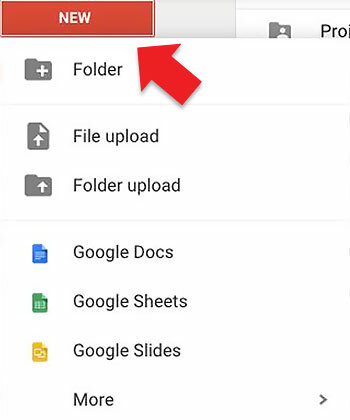 The URL (Uniform Resource Locator) for Google drive is http://drive.google.com. This is a cloud drive that allows you to save all your work. Here is a screenshot from Google Drive. Clicking on the New button brings up a whole array of choices. Google tools are always free and easy to share. Google Docs is for writing. Google Sheets is for spreadsheets. You might want to use a spreadsheet for math, charts and tables. Google Slides is just like PowerPoint and the More button allows you to create drawings, Forms or access Google maps. All of this work is easily shared with anyone by clicking on the Add people button on the top right hand side. When should you start your ePortfolio? You should start your ePortfolio as soon as possible. Every time you write for your ESL class, save the work. I have my students set up folders for each semester. They save all their writing in it. I work with them to correct it and then they save their final draft in a folder called Final Copy. This becomes their portfolio. When they need to display their writing online or add the link to their resume, they simply get the link by clicking on the share button. This brings up a dialog box with different options. You can allow people to just view your work, comment on your work or even edit your work. If you want to put a link to your work on your website or resume, click “Get shareable link.” When you are finished, don’t forget to click Done. That is all there is to it. Do you want to practice? Write a paragraph and share it with a friend who can help you edit it. Then you can add the paragraph to your portfolio. Happy writing! 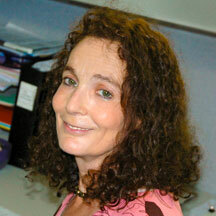 REGISTER NOW to learn to write better in English at USA Learns!